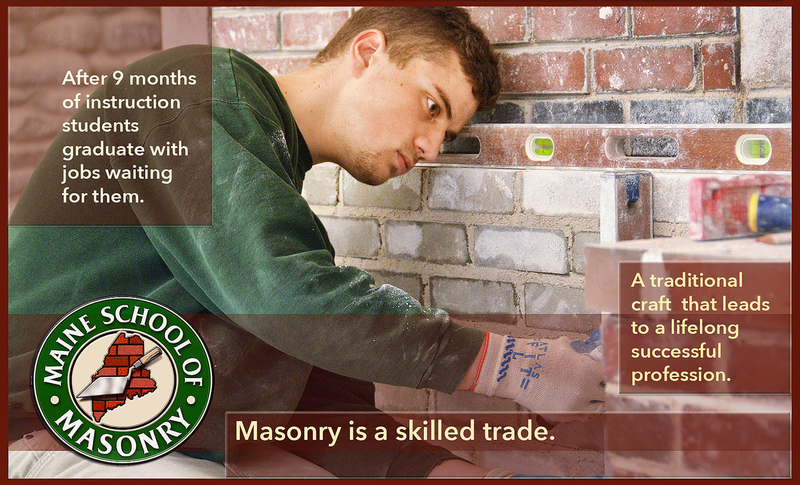 Maine School of Masonry is located in the Sandy River Valley surrounded by the Western Maine Mountains. The area is renown for it’s hiking trails with Mt. Blue National Park, Tumbledown Mountain, Maine Huts and Trails, with the Appalachian Trail, around the corner. ATV and snowmobile trails also abound. Some of Maine’s largest lakes are all less than an hour away. Canoeing, fishing swimming and camping are summertime pastimes. It’s a major ski area come winter, and it Maine it will. Shawnee Peak in Bridgton, Sunday River in Bethel, Black Mountain in Rumford, Saddleback Mountain in Rangeley and Sugarloaf in Carrabassett Valley are all our neighbors. Sugarloaf ski area, where the U.S.A. Olympic ski team trains, is just a 35-minute drive from the school. The nearby historic town of Farmington has wonderful amenities to offer. Great shops, restaurants, a movie theater, a gallery, the University of Maine fitness center, walking trails, as well as access to events at the University. The scenic town of Rangeley is only a 25-minute drive down the road where thousands flock to see stunning views in the autumn and get a taste of the Maine way. Directions: Please follow Route 4 north toward Rangeley, once you enter Avon the school is located on the right. Click on the map below for a map quest link.